I am the snack queen. Meaning, my style of eating is to graze on a variety of little things throughout the day. I’d like to say it’s because I’ve developed “smart” eating habits, but that is so not the reason. I’m a habitual snacker because I am always in the mood to eat. Haha. Simple as that. I enjoy munching on a variety of things throughout the day, rather than scarfing down a huge meal every few hours. The tapas way of eating is very appealing to me. Now, in reality, this style of eating is not always condusive to real life. During the week, we always sit down to a substantial dinner meal. That is a given, every night. I take more liberties with my eating during the daytime. I am not a huge breakfast person (I LOVE breakfast food, but I’m often not hungry for several hours after waking), which usually means that I snack on things througout the late morning-early afternoon. It’s the way I like to do it! I’ve passed this habit onto my son. And not for the better! He loooooooves snacks. He is a muncher. A grazer. Just like his mother. And it has made mealtime a bit of a headache! I’m working on it, though. I have been limiting his afternoon snacks much more to ensure that he’ll eat a more balanced meal for dinner, and it works most of the time. Sometimes it results in a total meltdown. A temper tantrum of epic proportions. And then I cave and give him the damn Wheat Thins or applesauce. Parenting 101: don’t follow my example! Anywho. Because I am such a snacker, I am constantly on the hunt for new snack ideas! Something that will fill me up for a little bit until my NEXT snacking session, with a good mix of fiber and protein. Sometimes I want something sweet, but most of the time, it has to be salty. My salty teeth are much bigger than my sweet ones! 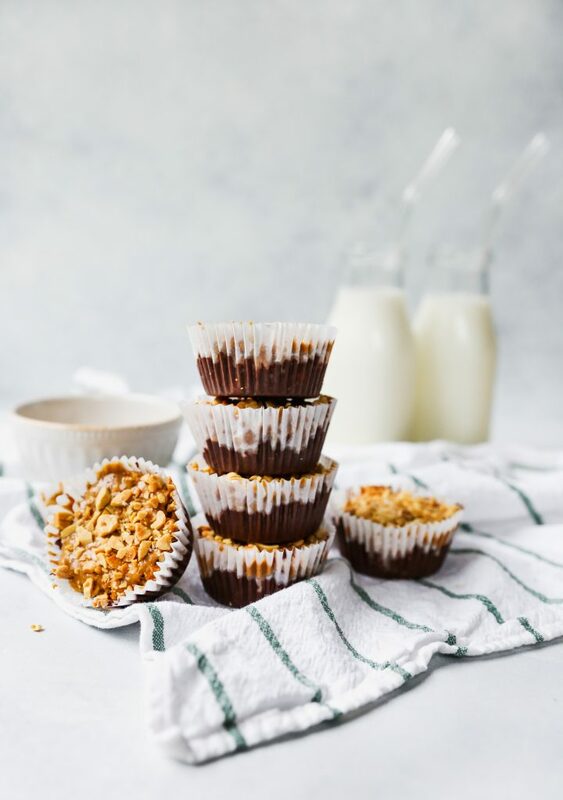 Enter granola cups! They’re the best of both worlds! 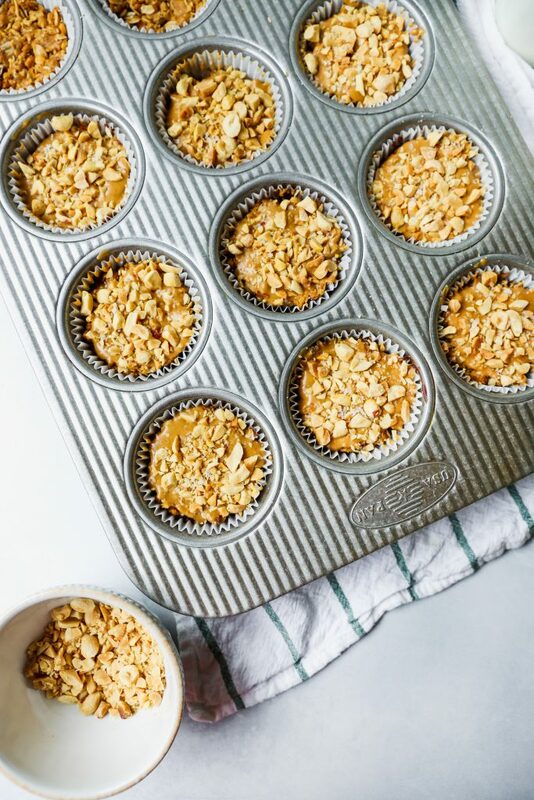 You may have seen the Nature’s Valley granola cups in the grocery store. These are my homemade riff on those…because those are flippin’ delicious. I wanted to make a homemade, less-processed version to keep on hand for snack emergencies. And guess what? The whole family loves ’em! Dan has been eating them as a late-evening, post-dinner sweet bite. I have been loving them as a mid-afternoon, get-me-over-the-2pm-hump snack. I also love them as a pre-workout snack. They’re loaded with good energy. And Kieran? Well, he would love to eat these at every meal. 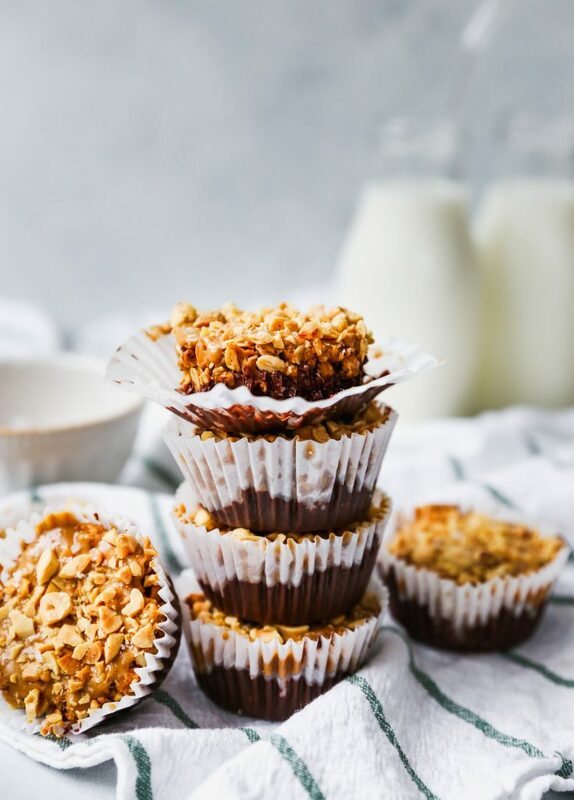 They are a great combination of all the things I love: the crunchy texture of oats and granola, creamy nut butter, the classic sweet-and-salty combo, and CHOCOLATE. Yum. 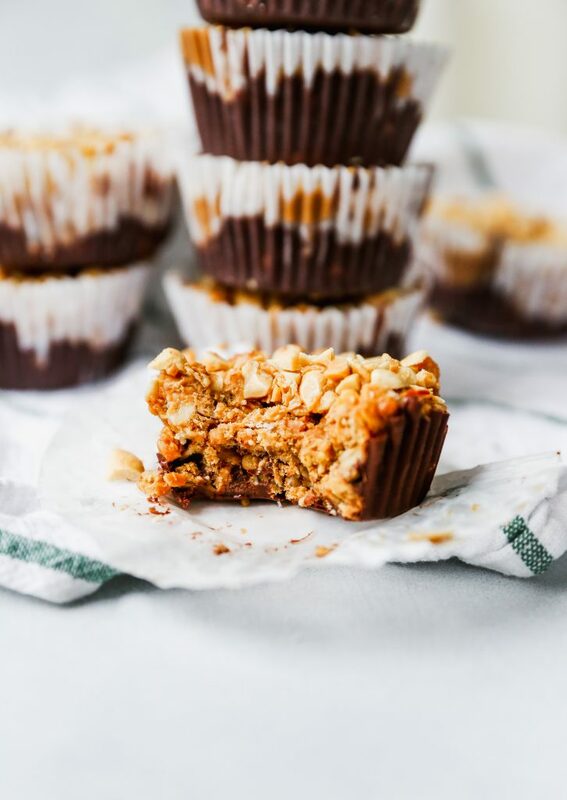 What goes better together than nut butter and chocolate? Very few things, my friends. Very few. Bonus: they’re quick and easy to make! 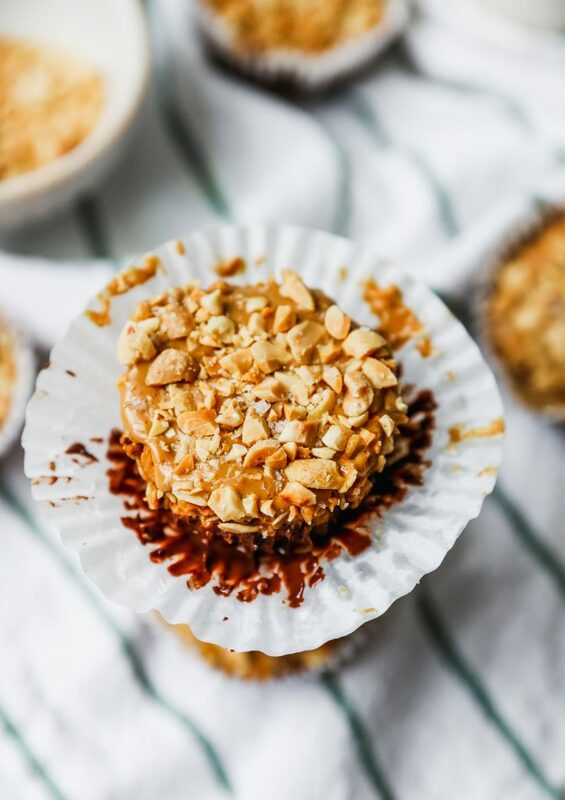 They’re technically a no-bake treat, but they do require some stovetop and microwave cooking. But both are easy steps! You basically heat your nut butter and some honey on the stove top until they’re hot and melty. 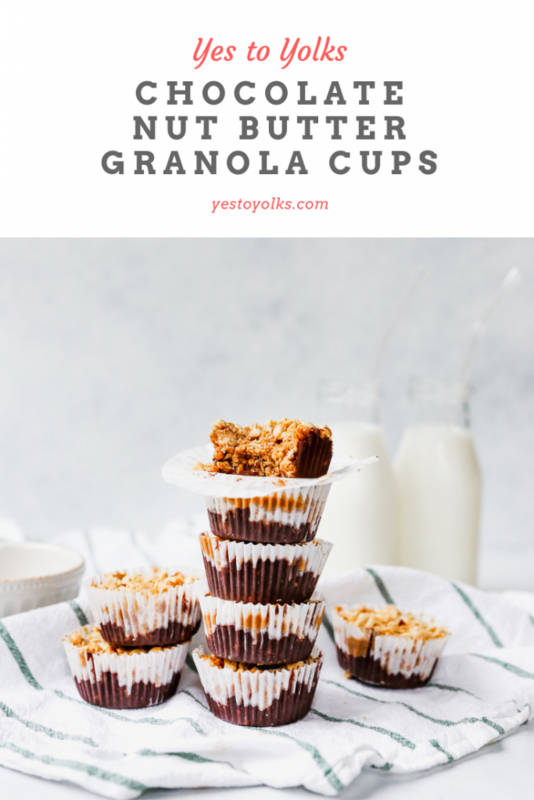 You pour the mixture over a bowl of granola, oats, and other nutritious ingredients. Then, you press the mixture into a muffin tin already layered with some melted chocolate. Last comes the nut butter topping! And chopped nuts! And a sprinkle of sea salt! Pop ’em in the fridge or freezer and you’re good to go. As soon as all the layers have set, you can dig in. I like to keep a batch of these in the fridge at all times. We’ve been loving them! They have been a total snack lifesaver on more than one occasion. They’ve saved Kieran (and me!) from several “hangry” meltdowns. Place the chocolate and coconut oil in a heat-safe bowl and microwave in 15-second increments until melted, stirring after each session. Spoon roughly 1 tablespoon of the melted chocoalte into each muffin cup. In a medium saucepan, heat together the peanut butter and honey until gently simmering. Whisk the mixture constantly so it smooths out. Place the granola, oats, flax, and hemp seeds in a large bowl and carefully pour the hot peanut butter mixture over top. Stir quickly to evenly coat everything in the peanut butter. Allow the mixture to cool slightly so that you can handle it without burning yourself; you still want it to be warm so it’s easy to shape. 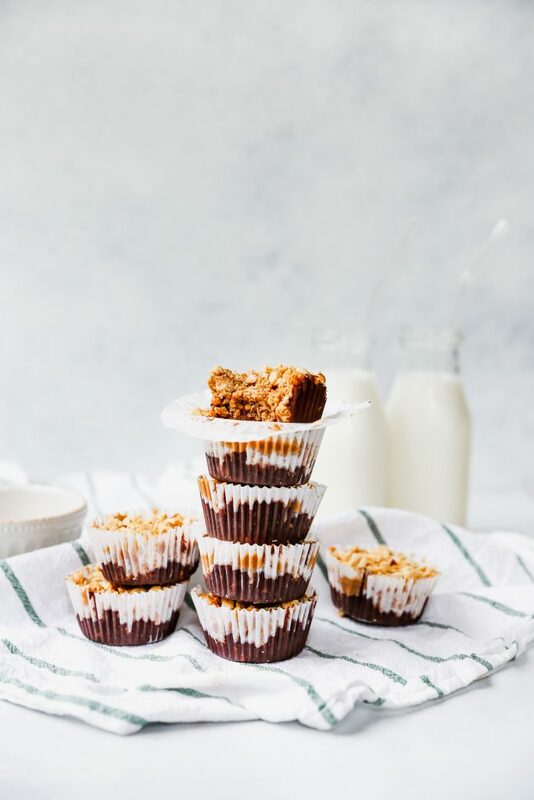 Using a cookie scoop, scoop out portions of the granola mixture and place it in the chocolate-filled muffin liners. Press down slightly so the two layers adhere. Warm the nut butter so it easy to work with (I do this in the microwave for about 20 seconds). 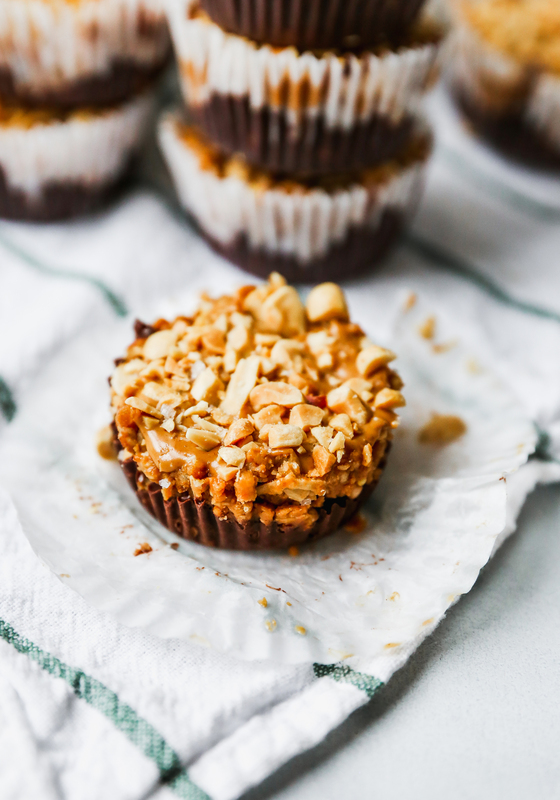 Spoon the nut butter on top of the granola layer in the muffin tins. Sprinkle with chopped nuts and flaky sea salt. Place the entire muffin tin in the freezer to set, about 10-15 minutes. Enjoy chilled or at room temperature. 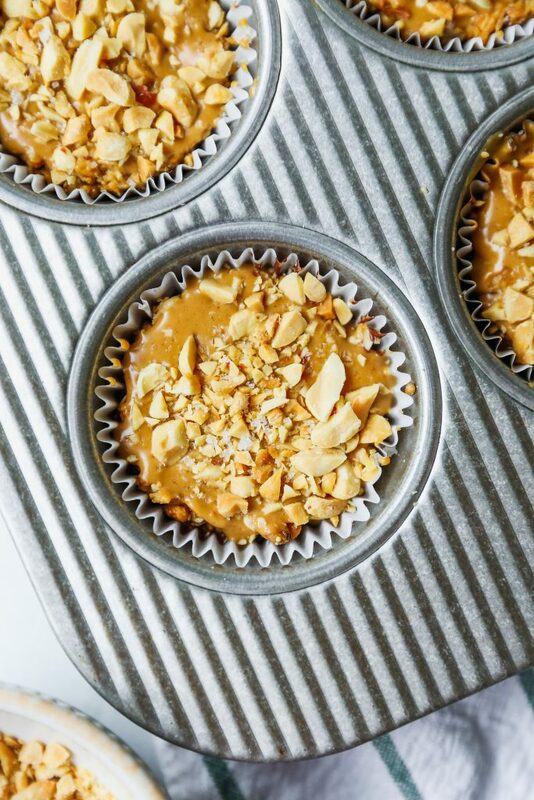 I tested these with peanut butter and cashew butter, and both were DELICIOUS. 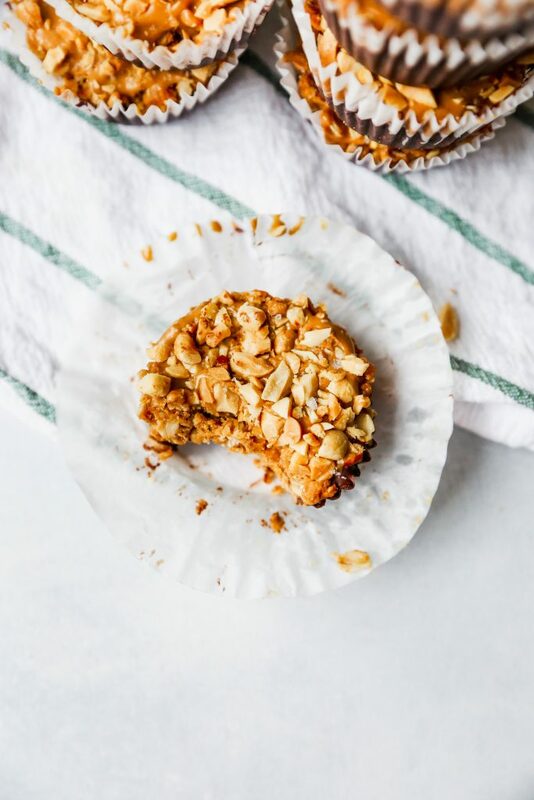 You can use almond butter or any other nut butter you prefer! 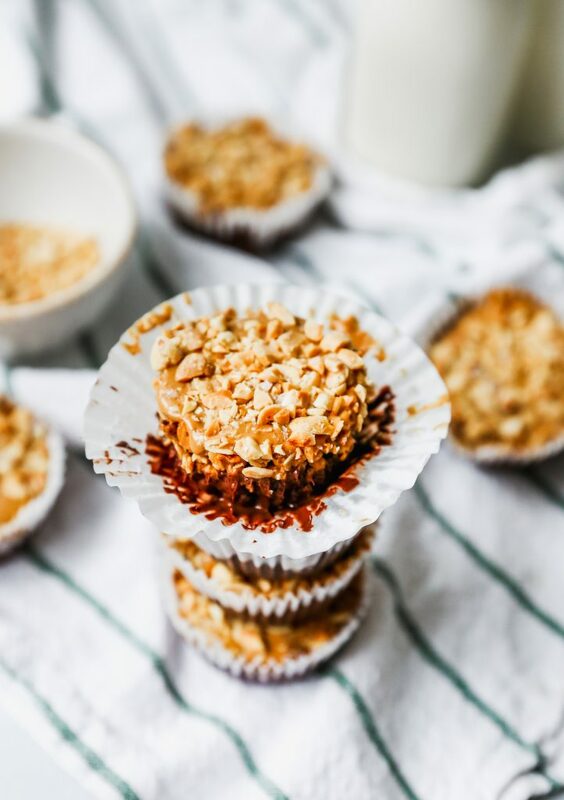 I recommend creamy over crunchy nut butters for this recipe. These keep best when stored in the fridge. They'll last in an airtight container in the fridge for a couple weeks.